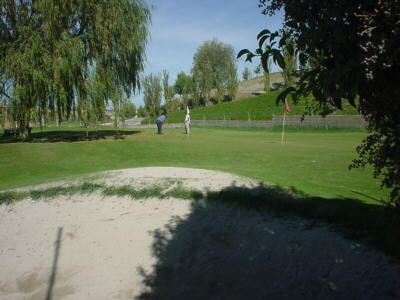 The Club de Golf at Granada, situated just south west of the city, is an 18 hole members’ club and, as such, is closed to visitors at the weekends. 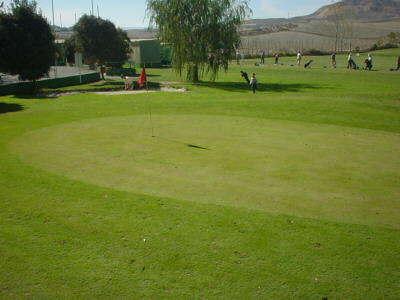 Originally built in 1986 it is more mature than many other courses in Southern Spain. Its popularity during the week has increased significantly over the last 6 or 7 years and, therefore, so have the green fees. However, the course still offers good value for money. There is a regular offer for 2 players, currently 72 Euros, and an excellent offer of 40 Euros each for 18 holes and the menu of the day which, as a norm, is a 2 course meal including a free drink. 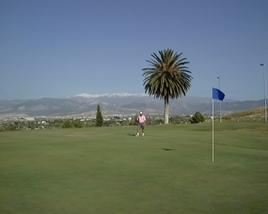 On the outskirts of the beautiful city of Granada, the golf club is set under a fabulous backdrop formed by the snow covered mountains of the Sierra Nevada. Views of the city and the Alhambra Palace are prevalent from a number of tees. Compared with Antequera this is a gentle course but, nevertheless, has a few challenging holes, the stroke index 1 being particularly difficult. Four holes are affected by water; one has an approach directly over water, another a tee shot directly over water and the other two have a long stretch of water alongside the fairway to catch a wayward second or third shot. A marginal disappointment about the course is a stretch of 5 holes around the turn which contains three par 3s and two very short par 4s. However, the 9th (which is one of the short par 4s) is a classic risk and reward hole where the correct line and distance can reward you with an eagle putt … but getting these spot on is not easy, especially for a non-member. Green fees are currently 36 Euros each if playing as a couple (they offer an unusual discount for “couples”) and not a lot more if you don’t qualify for the discount. The course is easy to walk so buggies are not required although they are available to rent. I am not aware of golf clubs being available to rent. Booking is essential here for non-members; the number to call is +34 958 584 060. 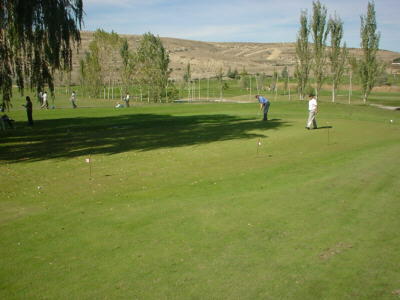 Their web site is: www.granadaclubdegolf.com from which 3 of the photos are taken. There is also a driving range seen in the background of this picture.